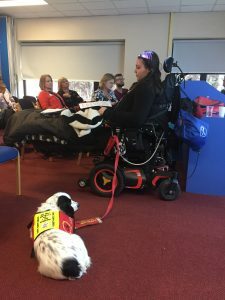 This blog is an adaptation of a speech I recently gave at King George Hospital, Ilford, at the Barking, Havering and Redbridge University Hospitals NHS Trust day on palliative and end of life care. It was well received and I wanted to share the messages from this speech to a wider audience using my blog. Communication, as we all know, is the cornerstone of healthcare – it’s a cornerstone of life. We, as human beings, as living creatures, are built for communication, connection and collaboration. However, communication is absolutely critical in healthcare. Communication between patients, their families and professionals, as well as communication between professionals, are absolutely essential to get right. Now, as a patient of the NHS with a serious illness, a life-limiting condition and complex health needs, who is a long-term, high-level consumer of healthcare services as a result, I have come across tens of thousands of healthcare professionals in my 25 years. All of these connections and all of this contact with professionals has revolved around communication. I hope this blog will be helpful to others and that my experiences – positive and negative – can influence you to improve how you communicate and get you to think more about what you say, how you say it and how you support patients and families during and after those conversations. I am not saying I have the recipe for perfect communication, but I hope my experiences can be used and benefit others. What is communication all about? It’s about conveying facts and information, it’s about speaking or otherwise interacting with others, it’s about conversations, it’s about sharing. However, communication is also about listening, perceiving, watching, learning. I want to start with two big movements going on at the moment, around communication. 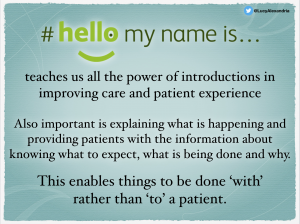 The well known #HelloMyNameIs… campaign, started by the late, great Dr Kate Granger and husband Chris Pointon, teaches us all the power of introductions in improving care and patient experience. Introducing yourself and your role is a very important part of communication, as is explaining what is happening and why and providing them with the information about knowing what to expect. Patients need to know who you are and what your role is, and where you fit into the team caring for them, as well as what is happening, why and what to expect – this enables things to be done ‘with’ rather than ‘to’ a patient. Feeling part of your own care and being treated as part of your own team is so very important, helps patients to take some ownership over their health and care and also enables them to be more activated patients – patients who will fare better outside of hospital as they feel ownership over the management of their health and will take greater responsibility for following their treatment plans. It’s about narrating what is happening to patients, what’s happening now and why, and then what’s going to happen in the near future, what they can expect to experience, and when and why things will be done. Narrating the future and their ‘journey’ or experiences moving forwards is so important. As Dr Kathryn Mannix, author or With The End In Mind often says in her book and in her incredible speeches, we need to narrate death and dying to patients and families – and in the same vein, we need to narrate the future to patients in healthcare generally. It begins with introductions to who you are, what your role is and where you fit into their team, then the professional letting the patients know what is going to happen, when and why, for example what scans or procedures they need and why they need them, and then what they can expect to happen and when these things will happen and open the door to questions and letting them know who to ask if they have questions in future. 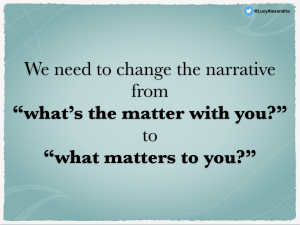 The other big movement is changing the question from “what’s the matter with you” to “what matters to you?”. This is crucial. It’s about building the care around the patient, their life, their experiences, their desired outcomes and framing everything from a “whole person” perspective, not treating people like a condition or constellation of symptoms. We are whole people, we are not a sum of parts. Changing the narrative to “what matters to you” framed the patient experience in a positive light right from the start, and also patients feel like they are a human being and that people recognise they have lives, families, experiences, hobbies, goals, interests, responsibilities and so on outside of their illness. You can’t communicate with a disease, you can only communicate with the person living with it. Patients are people, first and foremost. I wholeheartedly support these statements and can attest to their accuracy in how good communication can help patients. I want to share some examples of communication done well, and one of communication done not-so-well, and the impact on me (and my mother). I can wholeheartedly say I have the most amazing team of professionals and have had far, far more positive than negative experiences – yet, even just one of my negative experiences, detailed further down this blog, has a massive impact on me, years after it occurred. Communication really can make or break care. 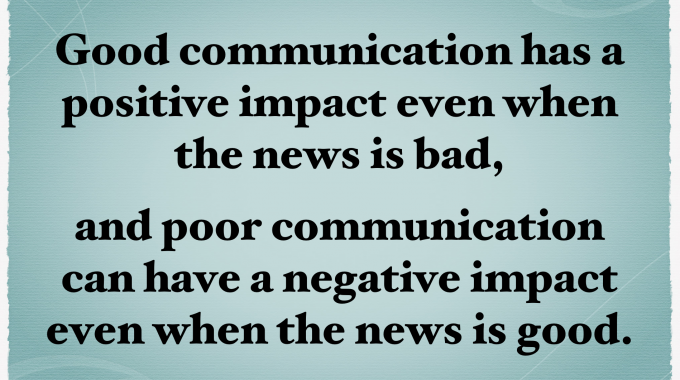 Good communication has a positive impact even when the news is bad, and poor communication can have a negative impact even when the news is good. Good communication has a positive impact even when the news is bad, and poor communication can have a negative impact even when the news is good. Two of the biggest conversations that I have had, ones which no doubt worries all doctors and nurses most, are conversations around end of life. I am extremely fortunate that the conversations I had about my condition being life-limiting, being given a prognosis and discussing my end of life wishes were done very well, very sensitively, very compassionately, and we were well supported. The first time we found out that my condition was going to shorten my lifespan was a positive experience, despite it being a difficult conversation. I must add, we’d had conversations before which hinted at my condition shortening my lifespan, but this was the first, concrete/definitive explanation that my condition was going to prematurely end my life. My consultant was talking to us about my condition and what was happening and in this conversation he told us that my condition was going to shorten my lifespan, saying to me and my mother that my condition is going to keep getting worse, and that they’ll do everything they can to keep me alive as long as possible, but one day my condition is going to end my life and it could be in a few years or it could be in 20 years, they just didn’t know. Regardless of any prognosis they could try to estimate, we needed to prepare for the fact that I wasn’t going to live a long life. At the time, I don’t think I really internalised what he had said, but mum on the other hand said “but she’d only be 37”, if taken at the 20 year top figure – and if taken at a few years, I may only just live beyond my 18th or 19th birthday. He was wonderful and stayed with us, answered our questions, checked we understood and explained that he’d continue doing everything he could to keep me alive and manage my condition to the best of our ability. However, I must mention the context of this conversation which was that this conversation came a week after my mum was told not to expect me to survive at all, that I was so critically ill from malnutrition and it had been left so long with me failing on tube feeds that he didn’t think I’d survive more than a few days, that despite starting TPN, he felt my body was too far gone to recover. Fortunately, he was wrong about that, I did survive, my body did accept the nutrition and TPN is still keeping me alive (almost) 8 years later, and I am very grateful he only told my mum about the fact I wasn’t expected to survive at all, because I think the fight I had left in me would’ve been somewhat diminished by not expecting to survive despite all the hopes we had for TPN. Sometimes knowing when not to communicate something with a patient, is as important as communicating with them, and I am not saying to withhold information, but to ensure that the right information is given at the right time. The sensitivity and compassion of my consultant communicating all of this with us made what are absolutely awful conversations more bearable. The hospice and palliative care team have been amazing over the 8 years I’ve been under them, and their communication around end of life has always been positive. It was with my hospice nurse at the time that we first opened the conversation to my death and end of life. This was when we conducted my first advance care plan conversations and filled out the preferred priorities of care and preferred place of death. In one of these conversations, we’d spent a long time talking about my death and end of life, what my wishes were, where I wanted to be, what measures I would want to be taken and so on, and as we reached the end of the conversation, Bev, my J’s Hospice nurse a the time, said to me “So what do you want to do now? What matters to you? What do you want to do in the time you have left?”. No one had ever bothered to ask me what I wanted. What would make my life fulfilling and enjoyable. What things mattered to me in my life. It was such a liberating conversation. It was in this conversation that I suddenly exclaimed to Bev, unexpectedly – even to myself, as I’d never given it conscious thought – that I didn’t want to die and be forgotten, for nothing to be different or better because of me and for my life not to have meant anything; that I wanted to make a difference. Bev didn’t forget this and this wish was given pride of place in my care plans. Initially, she helped me by me doing some filming for the hospice, and the journalist who was volunteering with The J’s at the time encouraged me to start my blog, but I wanted more. 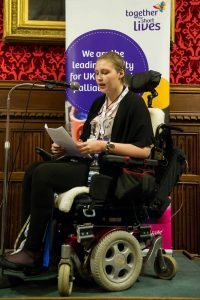 Then, in 2013, Bev heard that the children’s palliative care charity, Together for Short Lives, were looking for a young person to speak at their reception in the House of Commons on the transition from children’s to adults services, and despite having no speaking experience – and until then, absolutely no desire whatsoever to give speeches – and despite mum’s reservations – not of my ability, but of my shyness, lack of confidence and previous fear of being centre of attention let alone giving a speech to over around one hundred people – I accepted the opportunity. Later that year I delivered my speech, in the House of Commons’ Stranger’s Dining Room, to over one hundred MPs, hospice and palliative care professionals, health professionals and others, and I finished speaking (more like reading – my speaking has vastly improved now) and looked up from my pages of with my speech on, to the whole room erupting into applause. I had not felt achievement like that in such a long time. It’s like, after that, and after almost 6 years of being seriously ill and severely disabled, very isolated, bored and feeling like I had no place in society, that I had found my purpose, my reason to exist, and that I did have a place in the world. Life has changed dramatically and my life is unrecognisable. I have a life, a purpose and a job and mission in the world. I have made a difference. I have contributed. I am worthy of being here. Over the years with the hospice we have had some really tough discussions but they have always been positive experiences because the communication has always been of respectful, compassionate, kind, in a very supportive environment, taken at our pace, allowing us to take the lead and listening to what I am saying and truly hearing both the words and the message behind and important of what I have said. Another positive experience of communication came a year later, when I was 18 and a specific prognosis was attached to my condition. 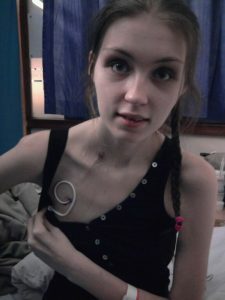 I’d had the most horrendous year, was in and out of hospital with acute bowel obstructions due to my severely damaged, inflamed, fragile and dysfunctional bowel, despite my Ileostomy removing my colon from the situation and despite having my PEG/gastrostomy on 24/7 drainage, and being on TPN. I was in hospital almost every week, to the point that Southend Hospital surgical assessment unit (SAU) almost always kept a side room free with an electric bed and a pressure mattress as they knew it was only a few days before I’d be back again, a rhylls tube put in, my Ileostomy stoma catheterised and the bowel suctioned, on strong pain relief and antiemetics above my normal drugs and waiting out my bowel to slowly decompress and to be open enough to allow some bile to pass through and for me to stop bilious/faecal vomiting. I’d also had some bad infections, my condition had progressed rapidly, I had more organ dysfunction, and physically I lost the ability to take a few steps, though I could just about stand up to transfer, I could no longer walk even a few steps, and we’d had a year of at minimum weekly admissions for at least 3 days at a time. My body was in such a state and we knew it was only going to get worse. After a year of this, another of my consultants came in one day to the ward in the Royal London, he sat on the bed beside my feet, told mum to sit down beside me and he started with “how are you?”. He then went onto reflect back on everything that had happened and the rapid progression of my condition and how we weren’t able to manage things very well as there were few ways of managing them effectively. He asked us if we had anything we wanted to ask him, or anything we wanted to say. And as the conversation developed, he took my hand and he said to me and my mother “you know we’ve talked a lot about things getting worse. Unfortunately, we are not always going to be able to resolve issues when they arise, and we can’t stop things from getting worse, your condition will continue to deteriorate and we cannot do anything to stop it. We don’t know how much longer you will be able to survive these complications.” Mum asked “how long?” he said he didn’t know for sure. So mum said “10 years? 5 years?” and he responded “5 years, at the most.” He spent about an hour with us, beyond his shift, talking to us and reassuring us, answering our questions. He communicated so gently, kindly, he showed great respect and compassion, and he took the time to explain everything and ensure we had all our questions answered. In a strange sort of way, we can look back positively upon that conversation, not because what he said was positive, but the way news was broken to us was done so well and so sensitively and compassionately, that it made a difficult conversation a positive experience. What did these two doctors do in their communication? They talked to us on the same level. They respected and appreciated our knowledge and our fears. They repeatedly asked if we had any questions. They took the time we needed and never rushed us. They were sensitive and tailored their approach to our needs. They communicated what they needed to say in a way that remained factual and detailed in terms of information, but that was not too pessimistic or distressing. They gave us positive experiences of communicating what is a horrific thing for a patient and their mother to hear. Obviously, my ‘regular’ team of doctors, nurses and professionals have an advantage – they know me and my mother well and of course can tailor their communication style to me, my needs and preferences. As such, they really are able to make sure they get it right every time. When you build a rapport with patients and you get to know them, it is so much easier to tailor your communication style to their needs – but you are encountering new patients much of the time; some of whom you will see over a period of time and get to know, others you may only see once. So, how can we get communication right every time? Part of communication is not so much about words, but about listening. About hearing what people are saying. About watching their body language and tailoring everything to their needs. If you listen and watch, you get a lot of information about how to tailor what you say and how you say it to the needs of the patient and their family. In the two above conversations I mentioned, they utilised listening as much as they did speaking. They gave us the time and the permission almost to process that information, to take it in, to recognise how we’re feeling, and to form questions we may have. 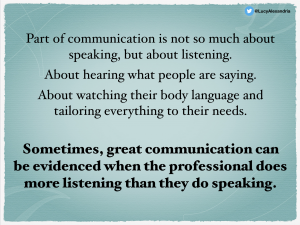 Sometimes, great communication can be evidenced when the professional does more listening than they do talking. In communication, another important factor is understanding the impact of what you say, how you say it, what the patient and family ‘hear’ (which may not always be the message you intended them to), the impact of what you’ve said on the patient and their family. It is essential you check understanding. The best way to do this, is to ask the patient and/or family member to repeat back to you what has been said. Not everyone will hear the message of what you’ve said, so checking their understanding and what they’ve heard and processed of what you’ve said is also important. However also important is professionals understanding the impact of what they’ve said, how they’ve said it and how they’ve delivered it. 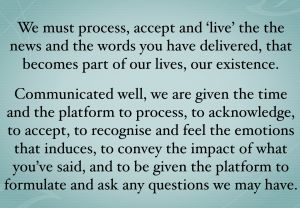 We, the patients and our family members, must process, accept and ‘live’ the the news and the words you have delivered, that becomes part of our lives, our existence, and communicated well, we are given the time and the platform to process, to acknowledge, to accept, to recognise and feel the emotions that induces, to convey the impact of what you’ve said, and to be given the platform to formulate and ask any questions we may have. To you, what are simply words explaining what’s happening or a test result or a prognosis, the minute those words leave your lips, the patient and their family have to live what you say. What you say becomes their world, their reality. It is so important not only to get how you communicate things right, but also to appreciate the impact of words on patients and families. t’s not just about what is said and how it is communicated, it’s about how the patient responds, understand the impact on them and tailoring your support to their needs. It’s also about choosing the right environment for the conversation you are having, about your body language, and working out who the best person to have that conversation or deliver that news is. We all have a different communication style and an essential part of any person or patient-facing role, is that you are able to adapt your communication style to the varying needs of people you will encounter and care for. Some people, like me, would rather have cold hard facts – I’d rather have the blunt truth than for people to try and sugar-coat what they’re saying, whereas others need a far more gentle, comforting and softened style of communication and may need a lot more support. I am not a healthcare professional, but I do a lot of peer mentoring and this has taught me so much about communication and how different we all are and how I have had to learn to adapt how I communicate and to learn new ways of communicating and to use different approaches with different people. I know everyone here will have encountered such a wide variation in the way they need to communicate with and care for patients and their families. On the theme of communication, I also wanted to talk about methods of communicating itself. Speech isn’t possible for everyone, or they may need other tools in conjunction with speaking to communicate, process and understand what is being said. It’s important for people with communication difficulties, specific communication needs such as people who use sign language and people with learning disabilities that we are able to adapt our communication to their needs and the tools they use. Be that ensuring you have someone who is trained in makaton or sign language, using social stories in your care to help a person with a learning disability understand what is happening, and using pictures and word boards to communicate with them. Drawing out what’s going to happen in surgical procedures is a well used communication tool to supplement spoken information – we all have the need for different communication styles, but there are also a wide variety of communication tools you may need to use with different patients. It’s about being open and if you can, educating yourself about the needs of your patients in advance and learning what you can – a friend who is profoundly deaf recently said that not everyone needs to learn sign language, but even if people knew the alphabet in British Sign Language, yes signing out each word letter by letter isn’t as efficient as proper signing, but at least you had basic tools for communication with BSL users. I am also a big believer in tools like the communication passports that are used a lot with people with learning disabilities, but could these be adapted for everyone? For every patient to have a cheat sheet of sorts at the front of their file that provides a brief overview of them, their experiences and how they prefer to be communicated with. Surely this would improve patient experience? I’ve given two positive examples of communication, and I just wanted to share one negative, which ties in with impact, with communication style, with the right person and the right environment, body language, not listening and not respecting or having compassion for patients. I was in an admission and I will add a lot went wrong in that admission, but a consultant came up to me and he stood next to my bed, standing over me, very aggressively questioning why I was on TPN and lecturing me about being on TPN and why I hadn’t tried enteral feeding, despite the fact he was the consultant who presided over me on enteral feeding and watched me wither away until London put me on TPN when I was at death’s door. He told me I needed to think about the future and if I keep having central lines, how I will have no central access when I am in my 60’s – despite the fact he knew my prognosis was extremely short in the first place, so I won’t make my 60s, but I certainly won’t make my 60’s without TPN as that is what is keeping me alive. He treated me like I was an imbecile, a faker, that I was having interventions I didn’t need, that I was ruining my own future and that I was the one who was shortening my own life, and he didn’t say it, but he made me feel like I wasn’t worthy of the care I was receiving, after he basically said I was consuming health services too much and I had too many doctors involved in my care. That conversation left a wound, that is now a scar. I always feel like a burden, a faker, a fraud, and unworthy. He’s caused me to get very nervous when I am meeting a new doctor, as I all fear they’ll treat me as he did. And I am a very confident, activated and knowledgeable patient, and yet he has left a scar on me that still affects me 4 years on. I talk so much about impact, and you can see from the other example conversations I gave how much a positive experience of communication can impact a patient, but this is an example of negative communication and the impact it can have.